HomeAbout Ataxia-TelangiectasiaLearn about A-THow is A-T Inherited? Every person’s body is made up of millions of tiny structures called cells. Each cell comes with a full set of instructions which tell the cell what to do and how to make our bodies work. The instructions are called genes, and they are made from a chemical called DNA. 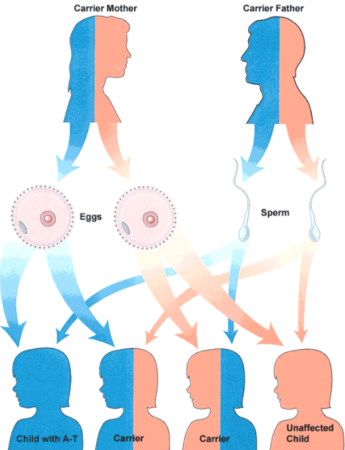 Genes usually come in pairs, and they determine everything about our bodies. For example, certain genes determine the color of our eyes, while other genes determine our blood type. Genes are often called the units of heredity because the information they contain is passed from one generation to the next. We all get one gene in each pair from our mothers and the other gene in the pair from our fathers. In this way our bodies work with a combination of instructions inherited from both our parents. Parents have no control over which genes get passed to their children. Ataxia-telangiectasia is called a “recessive” genetic disease, because parents do not exhibit symptoms, but they each carry a recessive gene which may cause A-T in their offspring. The genetic path of A-T is therefore impossible to predict, and a child with A-T is almost always a shock to parents. The recessive gene may lie dormant for many generations until suddenly two people with the defective gene have children. Each time two such “A-T carriers” have a child together, there is a 1-in-4 chance (25% risk) of having a child affected with A-T. And every healthy sibling of an A-T patient has a 2-in-3 chance (66% risk) of being a carrier, like his parents.